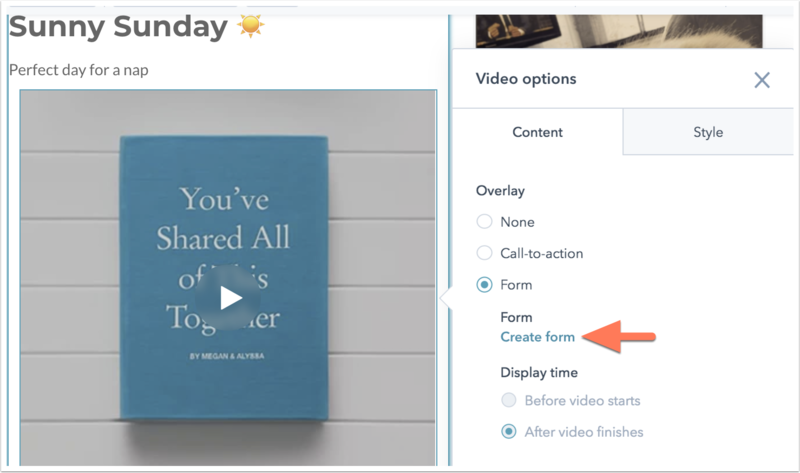 Add videos with CTAs and forms in your HubSpot blog posts, landing pages, website pages, and knowledge base articles. Please note: these features are independent of the Vidyard for HubSpot integration, which is a separate paid features for Vidyard customers. Marketing Hub Professional and Enterprise users can host and manage video in HubSpot-hosted blog posts, landing pages, and website pages. Service Hub Professional and Enterprise users can host and manage video in knowledge base articles. Due to spam and security reasons, embedded videos are not supported in email across most major email clients. It's recommended to insert a thumbnail or gif image of your video and link to the landing page the video is embedded on. In your HubSpot account, navigate to your blog, landing pages, website pages, or knowledge base. In a rich text module or in the body of the article, click the video icon insertVideo in the toolbar. If you haven't enabled your video features, you'll be prompted to enable them and accept the terms of service. In the dialog box, click Turn on new features. Please note: each user who wants to add videos to content in HubSpot must enable HubSpot Video in their own account and accept the Vidyard terms of service. If you have existing videos hosted on other providers (e.g. YouTube, Vimeo), you can migrate them to HubSpot after accepting the terms of service or embed them in your HubSpot content. In the Insert video panel, click the video you want to add to your page to insert it into your content. You can also click Upload videos to upload a new video file. Please note: accounts with Professional or Enterprise subscriptions have a limit of 250 videos, and each video is subject to the limitations of the file manager. Only videos with the Allow embedding, sharing, and tracking switch on, when accessing the video in your file manager, count towards the maximum limit of 250 videos. In the content editor, click the video and click Edit. In the dialog box, select Call-to-action or Form. Click Create CTA or Create form to create a new CTA or form for your video. Select a Display time to show this CTA or form before your video starts or after your video finishes. Please note: forms you've created for other videos can be selected for your video overlay, but you must create a new CTA for each video. Navigate to your blog, landing pages, or website pages. Click the name of a published blog post or page with video content. Video views: the number of times your video was loaded in a web browser. Video retention: the views of your video at each moment as a percentage of all views. 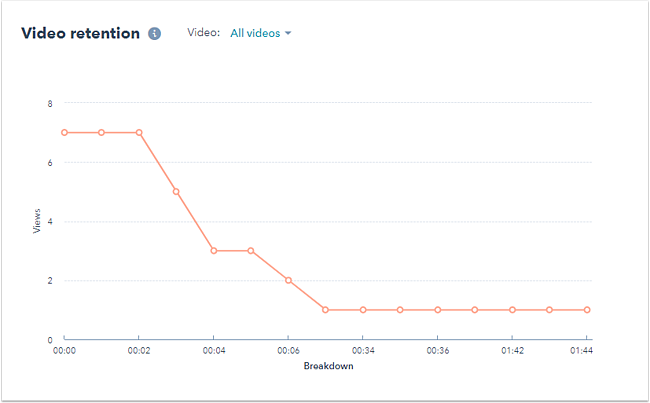 This gives you a better idea of whether viewers are stopping your video at a specific moment, and tells you how many viewers watched your video all the way to the end. Please note: video views and video retention metrics will only be triggered when the video is added to a standard rich text module. 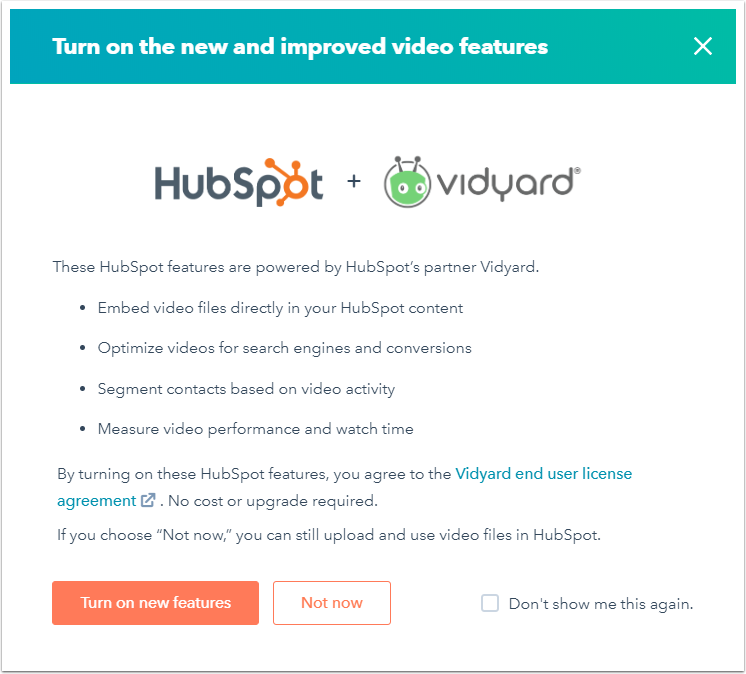 For example, if you embed a HubSpot form and add a Vidyard video to the inline thank you message, video views and video retention cannot be tracked. 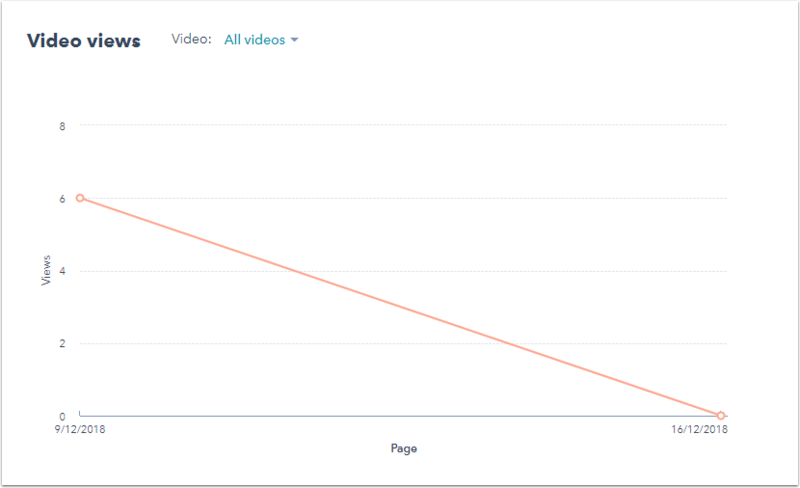 To filter these metrics by video, click the All videos dropdown menu and select the video.